Israeli warplanes struck the Gaza Strip on Wednesday after the first rocket fire from the Palestinian territory in weeks hit an Israeli city, in a blow to efforts to avert a new war. Gaza's Islamist rulers Hamas disavowed the rocket fire, saying they rejected "all irresponsible attempts" to undermine Egyptian efforts to broker a new long-term truce. But Israel, which holds Hamas responsible for all rocket fire from the territory regardless of who launches it, struck 20 targets in Gaza, killing one Palestinian, according to the Hamas-run health ministry. Israel also closed both its border crossings with Gaza in reprisal, further isolating the blockaded enclave where deteriorating living conditions have stoked violent protests along the border. 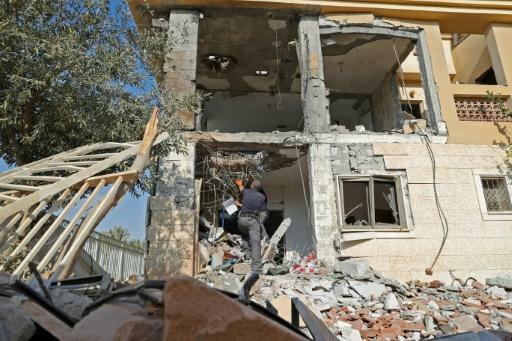 Gaza militants fired two rockets before dawn, one of which caused major damage to a family home in the southern city of Beersheba, 40 kilometres (25 miles) away, the Israeli army said. The family of three children narrowly escaped injury after their mother moved them into the safe room, with much of the rest of the house destroyed, the army said. "At 4 am (0100 GMT), Israelis in the city of Beersheba were running to bomb shelters after a rocket was launched from the Gaza Strip at Israel," the army tweeted. The other rocket came down in the sea off Tel Aviv, 70 kilometres (45 miles) from Gaza, the army said. Speaking after meeting with senior security officials Wednesday afternoon, Israeli Prime Minister Benjamin Netanyahu pledged a forceful response. "Israel views with utmost gravity the attacks against it on the fence, on the area adjacent to the Gaza Strip, on Beersheba -- everywhere," he said, referencing months of often violent protests in Gaza. "If the attacks don't stop, we'll stop them. I want to tell you today -- Israel will take very strong action." 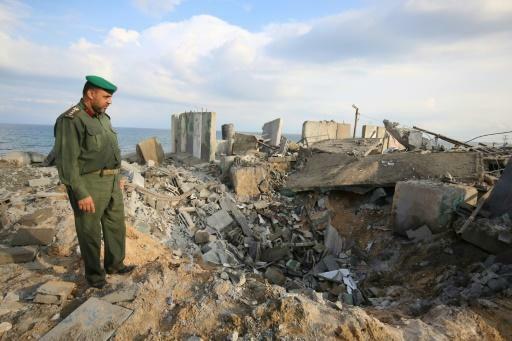 Hamas and allied militant group Islamic Jihad condemned the latest rocket fire as "irresponsible". But Israeli military spokesman Jonathan Conricus rejected the disavowal, saying Hamas bore "full responsibility" as Gaza's de facto ruler. Retaliatory strikes had hit 20 targets, including a Hamas attack tunnel and an "advanced weapons manufacturing site", he said. They killed one Palestinian in northern Gaza who the army said was set to launch a rocket. The military released a video showing a man near the border preparing a rocket for launch before being hit by a missile strike. 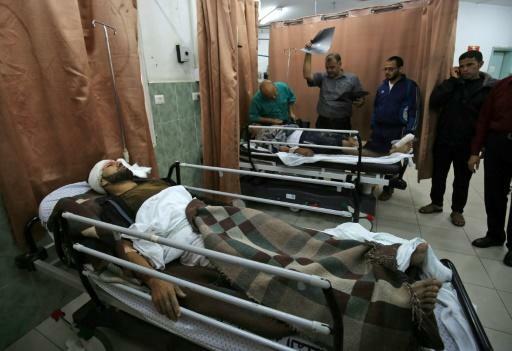 At least three other Palestinians were wounded in the strikes, the Gaza health ministry said. Defence Minister Avigdor Lieberman ordered the closure of both of Israel's border crossings with Gaza in reprisal, making the heavily restricted Rafah crossing with Egypt the enclave's sole gateway to the outside world. Lieberman also ordered the reduction of the permitted fishing zone off the Gaza coast to three nautical miles from six, his ministry said. Lieberman already suspended deliveries of fuel that had been trucked daily into Gaza under a deal brokered by the United Nations. Hamas has fought three wars with Israel since 2008 and fears of a fourth have spurred efforts by Egypt and the United Nations for a wider deal that would see Israel ease its blockade in exchange for a long-term truce with the Islamists. During a meeting with Israeli President Reuven Rivlin on Wednesday, UN envoy Nickolay Mladenov called the latest rocket launches a "dangerous escalation". "Unfortunately, they fit a pattern of provocations that seek to bring Israel and Gaza into another deadly conflict and confrontation," he said, pledging to work with all sides to avert one. The International Criminal Court's chief prosecutor said Wednesday she was closely following the situation and "will not hesitate to take any appropriate action". Fatou Bensouda said in a statement from The Hague-based court that she was "alarmed by the continued violence, perpetrated by actors on both sides, at the Gaza border with Israel." Rivlin said there could be no easing of the blockade while Israelis remained under threat of rocket attack. "So long as the missiles and the provocation continue on, there is no chance of easing the suffering of the people of Gaza," he said. The UN says Israel's 11-year blockade has resulted in a "catastrophic" humanitarian situation in Gaza. Its two million residents endure routine power cuts and a chronic shortage of safe drinking water, and more than two-thirds are dependent on international aid. The latest flare-up comes after months of Palestinian protests along the Gaza border that have drawn a deadly response from Israeli troops. The protesters have been demanding an end to Israel's blockade and the right of return to land now inside Israel, from which their families were expelled or fled during the 1948 war that accompanied its creation. At least 207 Palestinians have been killed by Israeli fire since the protests began on March 30. One Israeli soldier has been killed by Palestinian sniper fire over the same period.